U.S. Patio Systems and Home Remodeling proudly provides “stick built” basement finishing services in St. Paul, Minnesota, and elsewhere in the Twin Cities region. Stick built means that we adhere to traditional finishing practices by installing sturdy wood framing, insulation, and sheetrock instead of pre-fabricated structurally insulated panels (SIPs). This, we feel, is simply the best way to finish a basement, a method that can transform your basement into a seamless extension of your home in St. Paul. In addition to wood framing, insulation, and drywall, we can install flooring, HVAC ducts and vents, electrical wiring (including surround-sound speaker wiring), light fixtures, a basement bathroom, a basement kitchen – you name it. 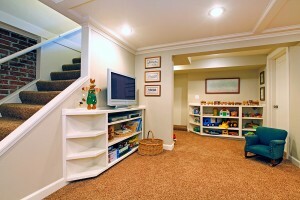 Finishing the basement in your home is a big investment. Thus, it is important to partner with a reputable basement finisher like U.S. Patio Systems and Home Remodeling. We use quality building materials, hire talented people, and are always committed to seeing that our customers get exceptional value for their money. Plus, we offer project financing for qualified homeowners with favorable rates and terms. To schedule a complimentary basement finishing consultation with a member of our design team, please contact U.S. Patio Systems and Home Remodeling today. As a leisure space specialization company, we also offer bathroom remodeling, sunroom installation, screen room installation, and pergola installation for homeowners in the St. Paul, MN, area.